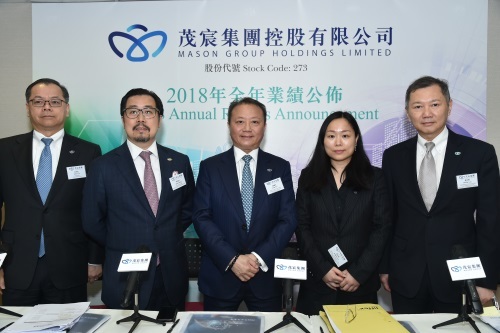 HONG KONG, Mar 26, 2019 - (ACN Newswire) - Mason Group Holdings Limited ("Mason Group" or the "Group", stock code: 273.HK) today announced its audited annual results for the year ended 31 December 2018 (the "Financial Year"). Benefitting from the continuing effectiveness of its "Health + Wealth" investment strategy, the Group successfully achieved a turnaround in 2018, with profit attributable to equity holders of the Group amounting to approximately HK$90.18 million. The Group's net profit increased by 564.94% to HK$176.01 million during the Financial Year, while its turnover rose by 9.47% to approximately HK$4,074.27 million. The board of directors recommended a final dividend of 0.067 HK cents per share, representing a dividend payout ratio of approximately 33.5%. The continuous improvement of the Group's results was mainly attributable to the organic growth and a series of strategic acquisitions and investments, signaling its success in building a "Health + Wealth" ecosystem with integrated healthcare and financial platforms. Mr. CHANG Tat Joel, Executive Director and Chief Operating Officer of Mason Group, said, "Financial services is at the very core of Mason Group's businesses. We explore and invest in healthcare projects with high growth potential to establish a world-class 'Health and Wealth' ecosystem that provides unique integrated health and wealth management services. 2018 was a banner year for us. The implementation of our 'Health and Wealth' investment strategy has helped us to achieve a turnaround and reaped gratifying rewards. The expansion of our geographical presence beyond Asia has in turn ushered in a new era in our development. We are en route to cementing our position as the leading global 'Health and Wealth Solution Partner'." In financial services business segment, the Group's performance was boosted by the acquisitions of European private bank, Raiffeisen Privatbank Liechtenstein AG, and Hong Kong-headquartered wealth management company, Harris Fraser Group Limited and its subsidiaries, Harris Fraser HK and Halena Co. Ltd. The combination of organic growth, acquisitions and investments during the year signified the substantial expansion of the Group's geographical footprint to Europe and Asia Pacific. All these efforts significantly strengthened its distribution channels and service capabilities, enabling it to create a foundation on which further development can thrive. During the Financial Year, the total turnover and operating income contributed by this business segment amounted to HK$901.39 million and HK$334.12 million, respectively, accounting for approximately 22.12% and 9.53% of the Group's total turnover and operating income, respectively. Amidst a fast-changing market environment, the Group expects its prudent risk management and client targeting strategies to pave the way for good returns throughout the coming year. In addition to the core business of financial services, the Group has explored and invested in industries and projects with high growth potential, in response to macroeconomic changes and market demand. Capitalizing on the market needs for cross-border medical services and the growing demand for premium healthcare, the Group has also focused on investing in healthcare projects, so as to seize the promising market opportunities. During the Financial Year, major steps were taken in the Group's investment in the assisted reproductive services business, with the establishment of Reproductive Healthcare Group through the merger of its subsidiary, Reproductive Healthcare Limited, and The Women's Clinic Group Limited, a leading premium IVF practice in Hong Kong, and the participation in a consortium to invest in Australia-based leading global fertility group, Genea Limited. During the Financial Year, the Group's healthcare business, comprising the provision of IVF services, genetic diagnostic and advisory services, and health screening services, generated an operating income of approximately HK$65.35 million in 2018. The healthcare division recorded a profit of approximately HK$140.85 million. For the Group's mother-infant-child consumer investment, AYD's foothold in China increasingly strengthened during the Financial Year, accumulating over 1,200 franchised and direct-sale stores and nearly 6,800 partnership stores in its regional network, with growth particularly evident in the number of franchise stores in Southern and Eastern China. In addition, considering the changing global economic conditions, rising trade barriers between countries, and regulatory uncertainties in the food industry, the Group decided to adopt a prudent approach to lessen its exposure in businesses involving cross border trading activities. The Group disposed of its stake of 46% in the Australian infant formula manufacturer Blend & Pack in February 2019. During the Financial Year, the Group's mother-infant-child consumer investment division posted an operating income of approximately HK$3,107.53 million during the Year, demonstrating an increase of 22.12%. Profit recorded for the division was approximately HK$116.16 million during the Financial Year. Mr. KO Po Ming, Executive Director, Chairman and Chief Executive Officer of Mason Group, said, "The encouraging results the Group achieved in 2018 was a testament to the merit of the development direction we have followed towards fulfilling the vision of growing into a premier global provider of healthcare and financial solutions. We will also renew our efforts in exploiting the growth potential of the Greater Bay Area, in addition to seizing the opportunities arising from the closer economic ties between countries along the '21st century Silk Road' as a result of China's 'Belt and Road Initiative'. Harnessing the synergistic benefits of our complementary healthcare and financial platforms, we will advance forward along the path charted by our overarching 'Health + Wealth' investment strategy and strive to deliver greater value to our shareholders."